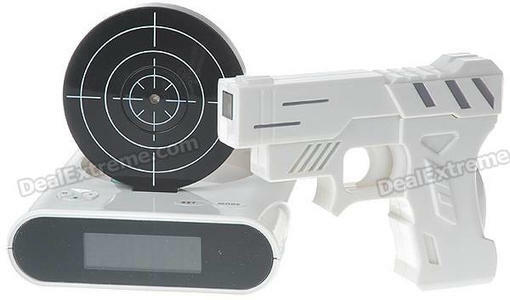 DealExtreme is selling a unique "LCD Gun Shooting Alarm Clock Set". Priced at just $21.70 with free shipping (one of their more expensive items), this is a digital alarm clock that you "to get you out of bed as you will need to aim your gun and start shooting at the target". Translation: You shoot the clock to shut off the alarm. It appears to be LED/IR based, but with these guys I wouldn't be surprised if it was a frigging green laser. Depending on your skill level, you can choose between "Normal" and the ominous-sounding "Hard" mode. Hidden bonus: you can record and use your favourite tune as the sound of your alarm! By tune I mean screaming, and by favourite, I mean Blackwalt. Submitted by Akuf on December 14, 2010 - 8:06am. I am still the coolest geek out there.